Wildfire Prevention ConsultingWildfire Planning, Modeling, Prevention, Vegetation Management, and GIS. Pre and post-fire computer modeling using state-0f-the-art tools like FARSITE, FLAMMAP and Wind-Ninja. Development and wildfire planning policy to mitigate hazards while protect communities and the environment. We develop and execute plans for vegetation management, structural hazard mitigation, and community risk reduction. 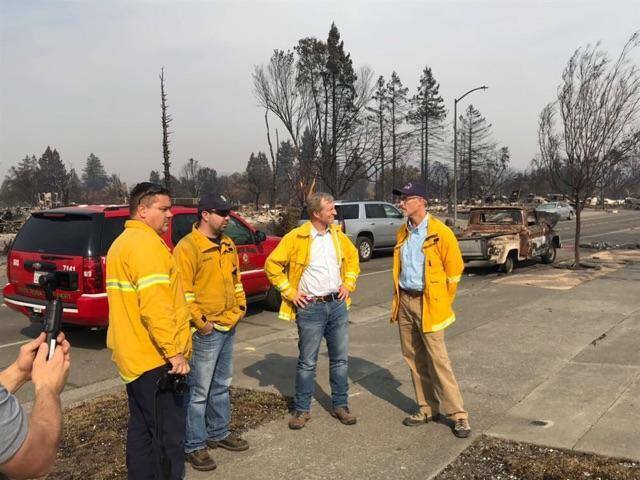 Todd Lando of XMR Fire discusses wildfire policy with Congressman Jared Huffman and Businessman Tom Steyer October 16, 2017 at Coffey Park, Santa Rosa.The western United States has a serious and growing problem with fires in the Wildland Urban Interface (WUI). More than 12 million homes are located in 7.8 million acres identified as WUI in California alone. The WUI fire issue will become even more serious with the California's population expected to grow from 28 million to 50 million people by 2050. Let XMR Fire's forestry and wildfire experts develop your community or agency wildifre prevention plan today. While public debate often focuses on increased spending for wildfire suppression - more aircraft, more personnel, and more firefighting equipment - time and experience has proven that wildfire prevention planning is more effective and far less costly than suppression. Wildfire prevention is less expensive and more effective than ever before. 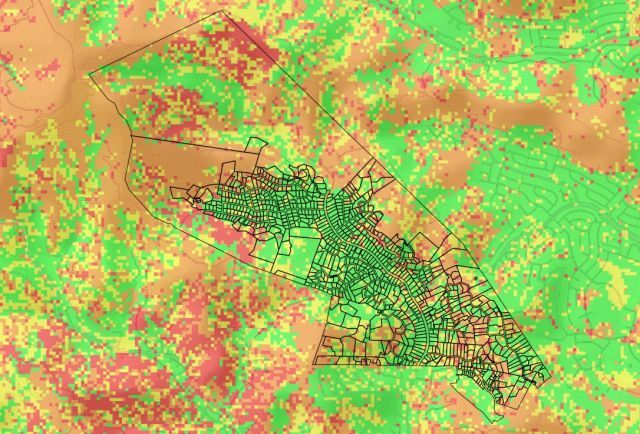 Sophisticated technology such as GIS, sattelite fuels mapping, geospatial fire behavior modeling, and hazard inspection databases let wildfire experts and urban foresters like XMR Fire Consulting analyze the physical nature of a potential fire using detailed data about the fire and fuels environment. A precise plan can be developed that includes environmentally sensitive vegetation thinning techniques to reduce fuel sources while preserving habitat and managing strategies for effectively responding to wildfire emergencies. Striking the right balance between suppression and prevention offers the best hope for minimizing the wildfire threat. XMR Fire employs dedicated wildfire experts, with decades or wildland firefighting, urban forestry, GIS, and fuels management experience who utilize a variety of advanced spatial applications, custom databases, and forestry field analysis tools to develop wildfire hazard assessments, Community Wildfire Protection Plans, and wildfire prevention plans. With extensive experience in wildfire suppression and urban forestry, XMR Fire has helped numerous fire agencies, fire safe councils, landowners, and businesses develop wildfire prevention and vegetation management plans across the western US. XMR Fire can assist municipalities, landowners, planning agencies, communities, and individuals better understand their risk and identify hazards with state-of-the-art wildfire modeling and mapping. We develop custom fuel models and utilize custom tools based on industry standard wildfire modeling software like FlamMap, FARSITE, BehavePlus, and Wind Ninja to simulate fire across and environment, potentially identifying assets and locations most likely to burn, and determining potential impacts such as heat output, spotting potential, and previously unknown hazards. Our modeling can assist in pre and post-fire planning, helping determing best locations for fuel breaks, determining travel time for fires under modeling conditions, and comparing scenarios and mitigation measures. Municipalities, landowners, planning agencies, and communities must adapt to wildfire by developing and implementing policies to address hazards while identifying and acknowledging risk. Land use policy, development and building standards, and design criteria are all addressed through hands-on hazard evaluation and risk assessment, utilizing modeling, expert knowledge of fire behavior and best practices. and a thorough understanding of the fire environment surrounding your community. We can guide plan development, including Community Wildfire Protection Plans (CWPPs), Hazards and Risk Assessments, and individual property vegetation and fire hazard mitigation plans. We assist fire agencies in development of wildfire hazard standards and code adoption, municipalities on land use and development practives to minimize risk, and homeowner groups on bylaw and policy adoption to address individual properties and open spaces.